Muscular, luxury SUV brings performance to the compact range. When was the last time you found a crossover utility vehicle exciting? Crickets. Yeah, I thought so. To be fair, there are some fun crossovers out there, but typically you’ll have to opt for the high-end performance edition and all-wheel drive to obtain one. And be prepared to pay through the nose if you follow through on your purchase. 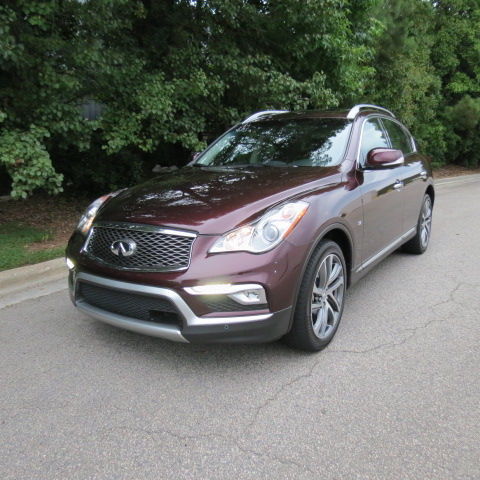 Then there is the Infiniti QX50, a small SUV with an attitude. As in standard rear-wheel drive and available all-wheel drive. It is priced from a very reasonable $34,450 ($35,850), offering a tantalizing entry-point to the Infiniti brand. It is the “bones” of a model that tells its story best, and for the QX50 that platform has yielded the Nissan 370Z (previously 350Z), a two-seat sports car. This salient fact alone demonstrates to all that the Infiniti QX50 is no run-of-the-mill crossover, to the cheers of enthusiasts everywhere. Now that you know the platform derivative, just where does the QX50 fit in the Infiniti naming universe? Over the past few years, Infiniti has gone with a new naming convention whereby all cars start with a “Q” and all utility vehicles begin with a “QX.” Two numbers follow, thus the QX50 is the smallest of three crossovers sold by Nissan’s luxury brand and is followed by the QX60 and the QX70. 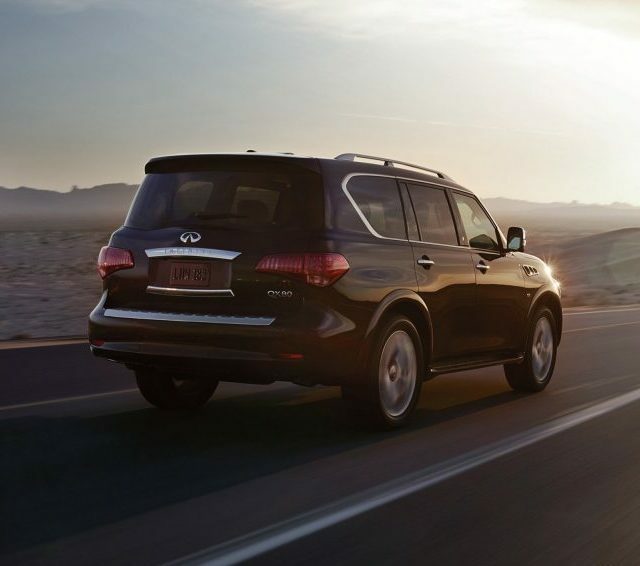 The top-of-the-line QX80 is a fourth utility vehicle, but it is a traditional truck-based SUV. Incidentally, the Infiniti QX70 shares the same architecture as the QX50 and 370Z, but it is slightly longer and wider than the QX50. Further, the QX50 was originally sold as the EX35, making the shift to its new name in 2014 when Infiniti’s current nomenclature was adopted. A 2016 Infiniti QX50 RWD was presented to me just as spring began to give way to summer. That’s noteworthy for two personal reasons — 1), school was out and traffic everywhere was lighter, and 2), it was hot as anything, which means I had the air-conditioner working at full blast. Being stuck in traffic on a hot day is not my definition of fun. Happily, that problem was avoided. Beyond its $34,450 base price, you can build your QX50 out to your heart’s desire. Infiniti dispenses with trim levels, supplying various packages to enhance the buyer experience. The test SUV came with four packages and one upgrade — illuminated kick plates, which added $440. Specifically, it was equipped with technology ($2,750), deluxe touring ($2,400), premium ($500), and premium plus ($2,000) packages. Add in the $995 destination charge and this SUV cost $43,535. For 2016, Infiniti made some changes to its smallest crossover, including adding 3.2 inches to the wheelbase. That’s the most important change and for a very good reason — the previously constrained rear seating space has more legroom, making it much more comfortable for adults sitting back there. Although the QX50 offers seatbelts for five, it is more comfortable for four. Earlier models were so tight that only smaller individuals (read children) could sit there in comfort. Previous problem resolved. Other changes bring in enhanced styling and new package content. We’ll look at some of that content shortly. Infiniti markets the QX50 as a “personal” crossover what typically describes an entry-level model geared toward the single buyer or the buyer with a significant other. That means the rear seat is typically an afterthought, notwithstanding Infiniti’s decision to improve leg and knee room this year. The price point is very attractive too, although an even smaller model, the QX30 will slot beneath the QX50 when it goes on sale later this year. Let’s just say if you’re looking to move from a mainstream brand such as Nissan to a luxury brand such as Infiniti, you’ll soon have more reasons to make that transition. A sporty visage is marked by a bold grille hemmed in by a pair of angular headlamp assemblies. The lower grille opening is slightly larger and is offset by stylish embrasures housing fog lamps and LED lights — both are circumscribed with a chrome-like design. The QX50 has a sloping, but muscular hood, strong shoulders, a rising belt line, and a coupe-like roof line. Upper character lines, rocker panel trim, chrome wheels, and color-keyed side mirrors are among its transcendent features. At the rear is a clamshell hatch amplified by a spoiler, oversized wraparound combination lights, chrome accents, and two sizable exhaust ports. Inside, leather covers the lower dashboard with soft touch material on top. The leather treatment extends to the steering wheel, door inlays, and the seats. No cheap materials are found here. The test model gained an 8-way power driver’s seat and 2-way lumbar support by means of the deluxe touring package. The instrument panel features pairs of large and small analog displays with a digital driver’s information display centered between the two. The main drawback for this model is the center console layout. The available 7-inch color display (courtesy of the premium plus package) sits on top and immediately below that is a dial and switches for controlling same. However, those controls are pitched at a downward sloping angle — for tall drivers, reading them shouldn’t be a problem. But for shorter drivers you may need to crane your neck to decipher the keys. Beneath the console is an analog clock, audio and climate control dials and switches, followed by a small concealed storage compartment. Between the seats is a the transmission shifter stick, as well as switches and knobs controlling seat temperature and the driving mode — normal or snow. Two cup holders are present as well as the requisite armrest with a nifty compartmentalized design. You’ll find a 12-volt outlet and a USB port therein. My main criticism with the center console design is its layout. With the cup holders placed where they are, shifting means you’ll find interference whenever drinks are present. Of course, the cabin is fairly compact , so that means reworking the area means possibly adding cup holders that spring from the dashboard or perhaps abut the base of the center stack. As it stands, the QX50 has only four drink holders — the other two are found within the rear seat drop down armrest. The front doors have narrow storage slots, but they are not large enough to hold drinks. The rear doors do not offer storage compartments. The rear storage compartment is spacious and comes with a cargo light and tie down clips. There are also a pair of switches for managing the 60-40 split folding rear seat. Press either button and a portion of the seat automatically drops down. Hold the button and the seats rise up. Underneath the cargo area floor is a temporary spare tire. It sure beats the feature typically found in many luxury cars today, namely a power tire inflator. When you’re ready to drop the hatch an embedded handle is present. Sorry, no electronic switch is available. Kudos to Infiniti for designing a quiet model with a comfortable ride. But that comfort doesn’t come at a cost to driving dynamics. All QX50 models are powered by a 3.7-liter, V-6 engine making 325 horsepower and 267 foot-pounds of torque. It is naturally aspirated and that means no boosting is offered — turbo or supercharger. That’s fine with me as there is generous amounts of energy at the ready for an engine paired with a 7-speed automatic with adaptive shift control. If a crossover were to offer a manual transmission, this Infiniti would be the ideal model to include one. As it stands, the only Infiniti model in North America to offer a manual is the Q60 coupe and convertible. But a shiftable automatic is the next best thing and in this Infiniti the fun factor is amplified. Step on the accelerator and you’ll immediately gauge that the power emanating from underneath the hood is generous. Infiniti could have stuck an inline four underneath, but they did not. Instead, you have a potent and at times raucous V-6 that has the power and the passion to move this model. Never once did I feel the QX50 was underpowered. The engine immediately snaps to attention, delivering copious amounts of power throughout the band curve. Where this model truly shines is on the open road or should I say on the twisty back road where you can push the SUV to its limits. But before you get moving, switch the transmission stick to manual mode and have at it (no paddle shifters are available). But be forewarned — this arrangement doesn’t override your upshifting, so be attentive that you don’t redline it. I nearly did once when I forgot I had it in manual mode. The shifter moves quickly between gears and helps push the crossover down the road with authority. Power-assisted steering is present; handling is enhanced by a subframe-mounted independent front double-wishbone suspension with aluminum-alloy upper and lower links, twin-tube shock absorbers and a stabilizer bar. At the rear, the suspension features an independent multi-link design with aluminum-alloy upper and lower links and axle housing, twin-tube shock absorbers and a stabilizer bar. Vented front disc brakes and standard rear disc brakes bring this model to a stop. Although not as “involved” as a 370Z or other sport models, the QX50 does offer an enjoyable driving experience. It is still a high-profile vehicle so when you hit the twisties you’ll sense some body roll and you’ll probably find yourself easing up on the accelerator and perhaps tapping the brake pedal. Once you get the hang of it, you may find the ideal balance of performance and utility, what truly makes this model shine. So, how do you make a case for the QX50? That’s easy — you are a sports car enthusiast, are married, and have just started a family. No stodgy minivan or a torpid crossover for you. Instead, you want something similar to the Porsche Macan, but at a more reasonable price. Enter the Infiniti QX50. Granted, few people will settle for the low price point, given the amenities offered. If you want navigation, then the $2,000 premium package must be ordered. If you want power amenities, then the $2,400 deluxe touring package should be considered. It is at this point you cross the $40,000 mark, but that’s still $7,500 less than the Porsche Macan, perhaps the best-known model in this segment. 2016 Infiniti QX50 photos copyright Auto Trends Magazine.